Ghosts like Halloween almost as much as you do. Here are some great ideas to haunt your Halloween. These are much more than a sheet with holes, although that can be effective too. What is Halloween without ghosts? That is almost like not having candy or treats for the kids or Cookies without milk. Ghosts will definitively add to your display, whether they are inside or out. Some of these displays are simple while some are quite complex and use animatronics to help entertain trick or treaters. 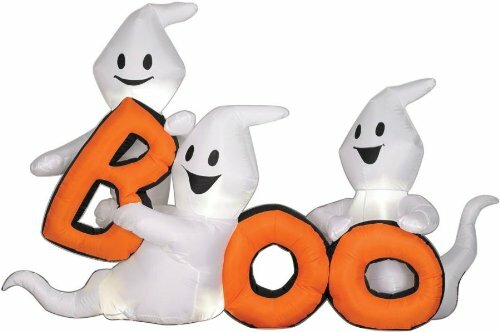 These ghouls will liven up your display, without being too scary for the smaller trick or treaters. They will enhance your Halloween yard decoration display. After all, people don't sit around the campfire and tell Halloween stories. They tell ghost stories because they are popular and scary. This frightening fiend is over three feet tall and appears to be floating, Your new friend has glowing eyes, makes moaning sounds, and will rock back and forth. He uses 4 AA batteries for power to save his ghostly powers. Will this be your guard for the candy bowl? This display is almost three feet tall and the foam filled latex rubber will last for years. 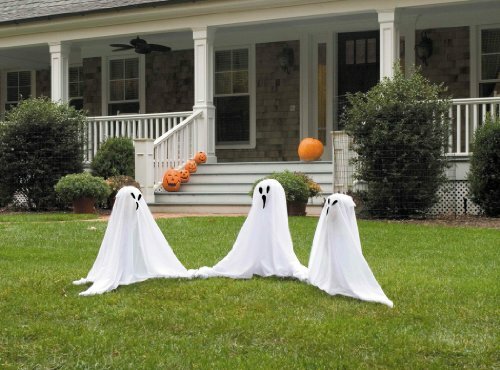 This ghostly trio will help dress up your yard much to the delight of neighbors and trick or treaters. Each ghost is 36" tall and has a lawn stake that keeps them in place and prevents them from haunting the neighborhood. 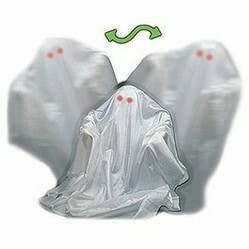 These ghosts would be great in a graveyard display or by themselves. You can use a spotlight at creative angles to help enhance these friendly ghosts. Inflatable lawn decorations are not just for Christmas anymore! These books will help you design a great Halloween display and give you many money saving tips. Be spooky and green at the same time! This awesome door cover will definitely grab the attention of trick and treaters. It is made of weather resistant poly and is 36" by 60" and will cover your door for years to come. What is a ghost? 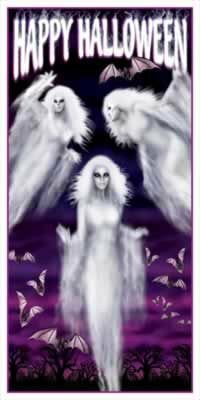 A loose definition might be: the spirit or soul of a dead person which makes its presence know to the living by appearing or causing some action to happen that is noticed by the living. Do I think they wear white sheets? No, probably not. 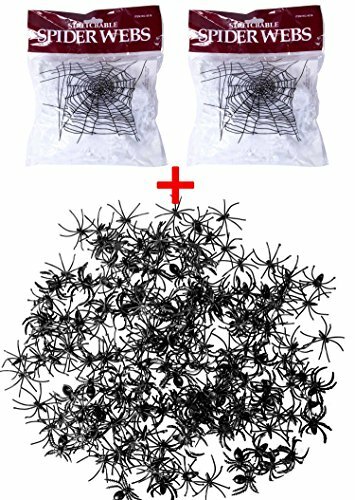 I think that is a popular concept because it's so easy to make a Halloween costume out of an old sheet. Do I believe in ghosts? No, but they make great Halloween displays! Is one of these Casper the Friendly Ghost? Probably not, but they are still very friendly and will not scare the youngsters. This trio measures 57" tall and are eight and a half long and get their spectral energy form the ac cord. This display actually is inflatable and will last for years.